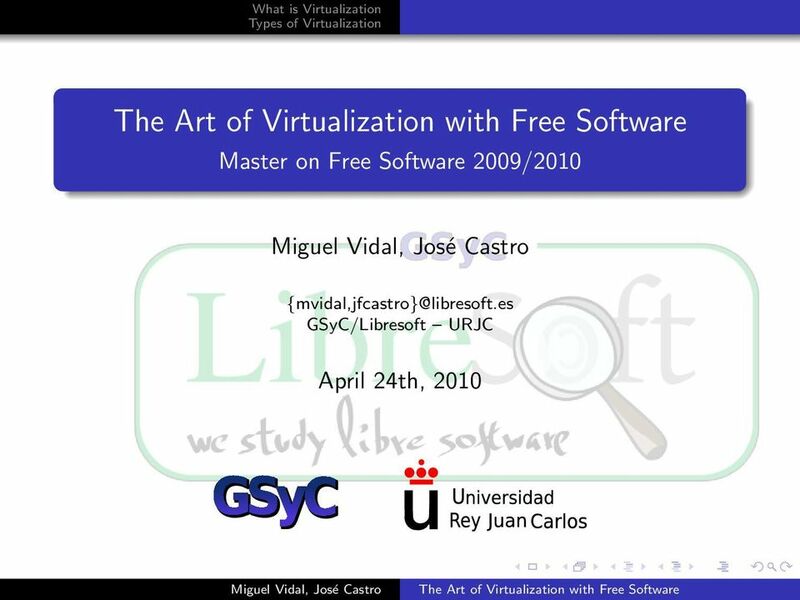 Download "The Art of Virtualization with Free Software"
5 What is Virtualization Hardware/software combination, which allows a computer to act as several ones. It includes making a single physical resource (such as a server, an operating system, or storage device) appears to function as multiple logical resources. 6 Definitions What is Virtualization Virtualization is a methodology of dividing the resources of a computer into multiple execution environments. Virtualization applies one or more concepts or technologies such as partitioning, time-sharing, partial or complete machine simulation, emulation, quality of service, and many others. 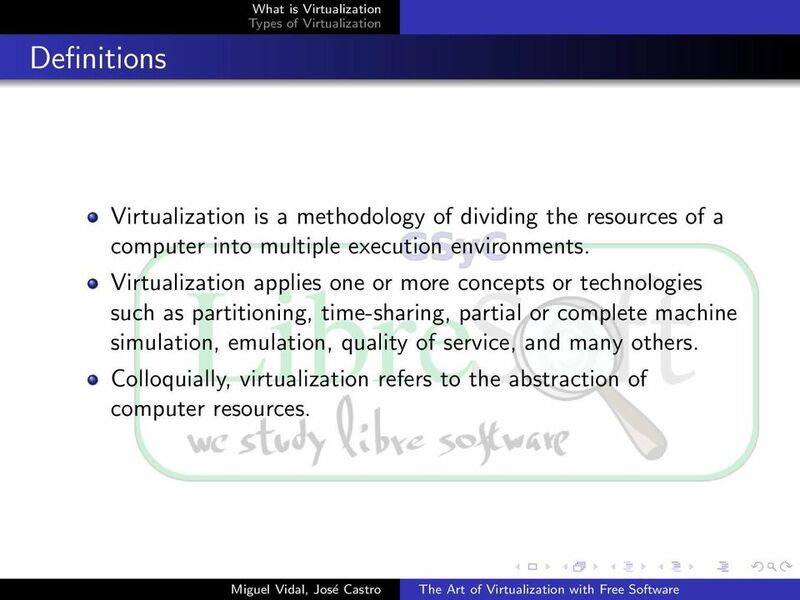 Colloquially, virtualization refers to the abstraction of computer resources. 7 Hypervisors What is Virtualization In modern computing, Virtual Machine Monitors (aka hypervisors) allow many different OS, tasks and software configurations exist on the same physical machine. The hypervisor abstracts the physical resources of the host computer into discrete virtual machines. Hypervisors ensure some level of isolation between guests. Hypervisors also provide a uniform interface to the hardware. 8 More on hypervisors We have two hypervisor classes: Type 1 (or native, bare-metal ): the hypervisor is a layer between hardware and all OS. The host OS is known as Control Domain, and runs over the hypervisor. Type 2 (or hosted ) the hypervisor is a software layer running over the host OS. 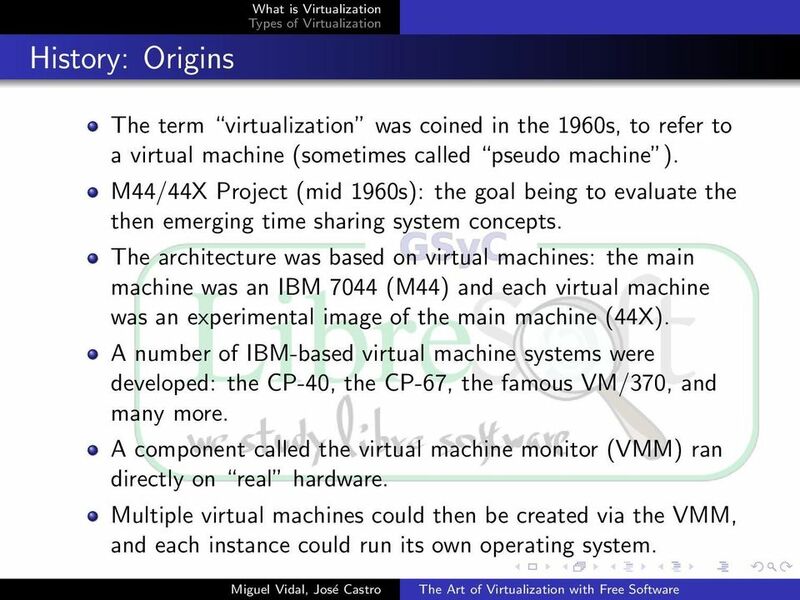 9 History: Origins What is Virtualization The term virtualization was coined in the 1960s, to refer to a virtual machine (sometimes called pseudo machine ). M44/44X Project (mid 1960s): the goal being to evaluate the then emerging time sharing system concepts. The architecture was based on virtual machines: the main machine was an IBM 7044 (M44) and each virtual machine was an experimental image of the main machine (44X). A number of IBM-based virtual machine systems were developed: the CP-40, the CP-67, the famous VM/370, and many more. A component called the virtual machine monitor (VMM) ran directly on real hardware. Multiple virtual machines could then be created via the VMM, and each instance could run its own operating system. 10 Virtualization Extensions for x86 Since 2005, Intel and AMD have added additional hardware support to virtualization. Intel Virtualization Technology (VT) codename Vanderpool AMD Virtualization (AMD-V) codename Pacifica Added explicit funtionality to enable higher performance hypervisors for full virtualization. Full virtualization is easier to implement. Xen uses theses hardware extensions to support full virtualization. 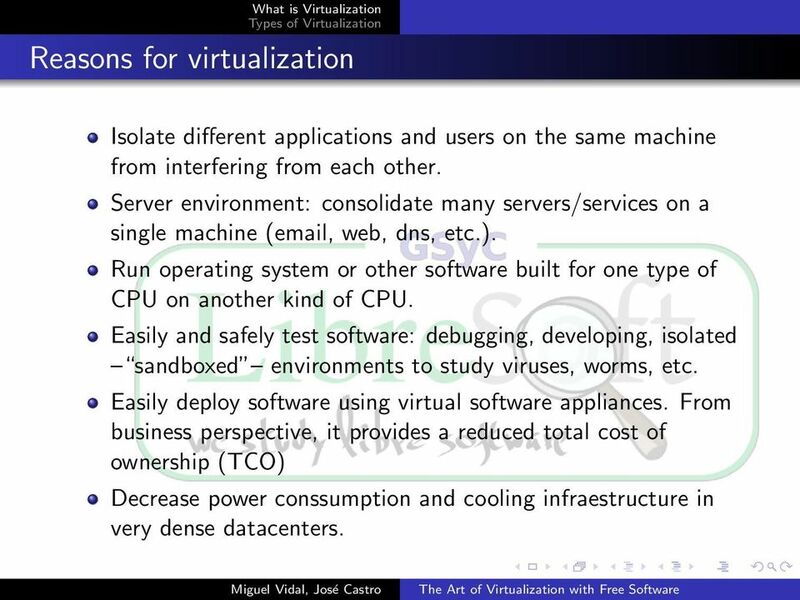 11 Reasons for virtualization Isolate different applications and users on the same machine from interfering from each other. Server environment: consolidate many servers/services on a single machine ( , web, dns, etc.). Run operating system or other software built for one type of CPU on another kind of CPU. 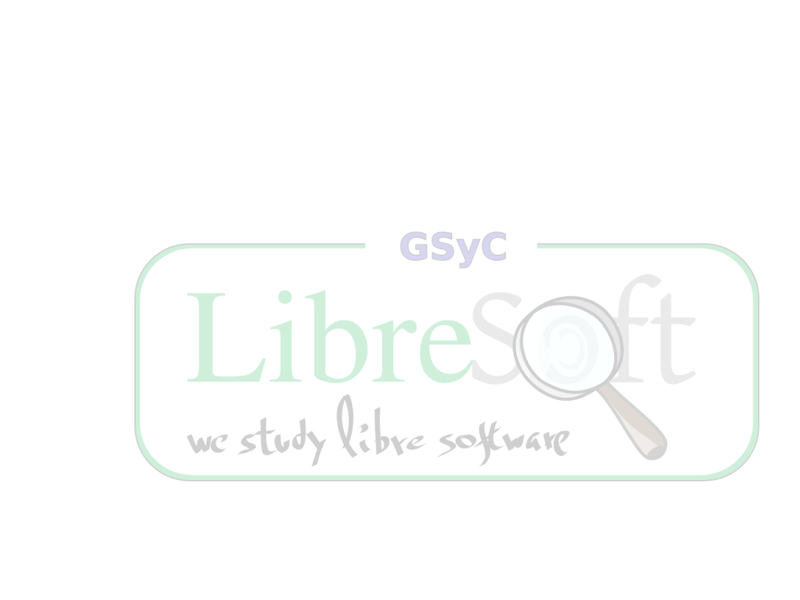 Easily and safely test software: debugging, developing, isolated sandboxed environments to study viruses, worms, etc. Easily deploy software using virtual software appliances. From business perspective, it provides a reduced total cost of ownership (TCO) Decrease power conssumption and cooling infraestructure in very dense datacenters. 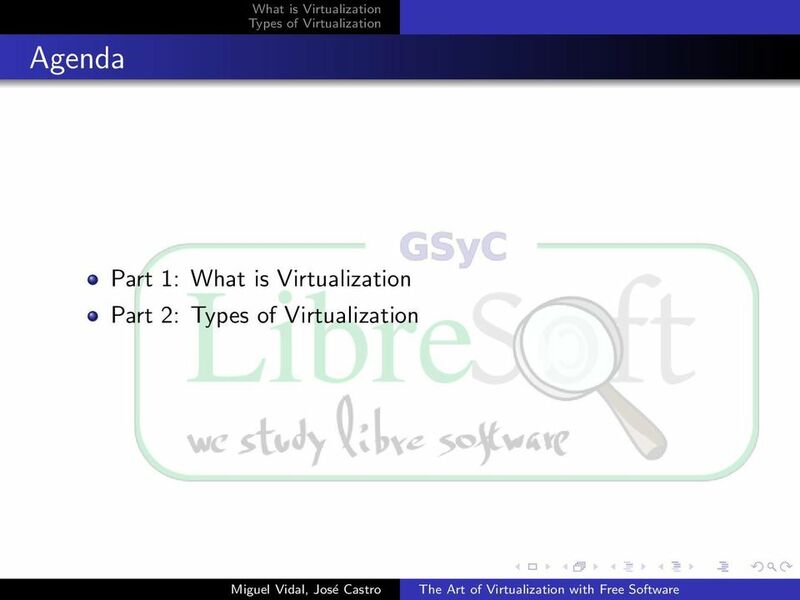 12 Basic concepts What is Virtualization The native Operating System running the virtualization software is called the Host. The host has control of the real hardware. 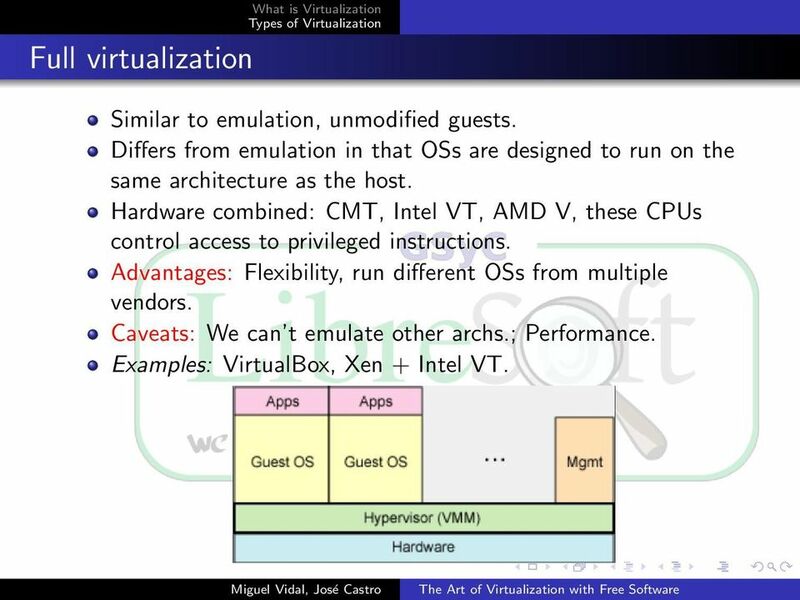 The virtualized OS is called a Guest. There can be many Guests on a single Host. Guests must not interfere with each other or the host. 13 Virtualization concepts The virtualization software is called: Hypervisor. Virtual Machine Manager or VMM. The VMM or Hypervisor is running as part of the host OS (or it s the host). A virtual hardware instance is called a Virtual Machine or VM. The Guests OS run inside a VM. 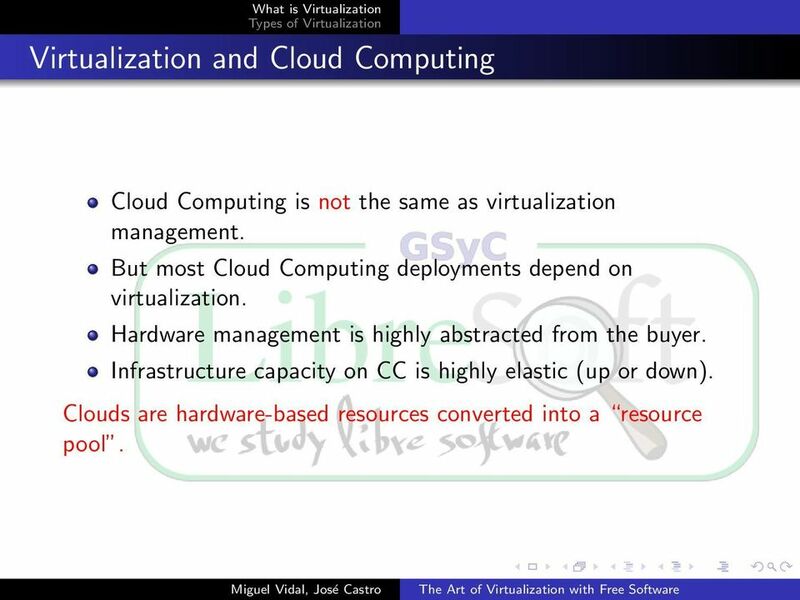 14 Virtualization and Cloud Computing Cloud Computing is not the same as virtualization management. But most Cloud Computing deployments depend on virtualization. Hardware management is highly abstracted from the buyer. Infrastructure capacity on CC is highly elastic (up or down). Clouds are hardware-based resources converted into a resource pool. 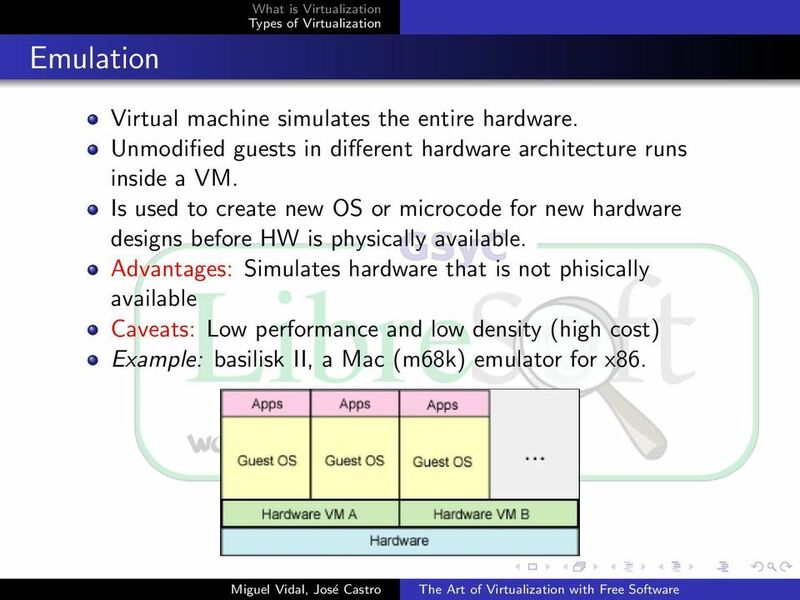 17 Emulation What is Virtualization Virtual machine simulates the entire hardware. Unmodified guests in different hardware architecture runs inside a VM. Is used to create new OS or microcode for new hardware designs before HW is physically available. Advantages: Simulates hardware that is not phisically available Caveats: Low performance and low density (high cost) Example: basilisk II, a Mac (m68k) emulator for x86. 18 Full virtualization Similar to emulation, unmodified guests. Differs from emulation in that OSs are designed to run on the same architecture as the host. Hardware combined: CMT, Intel VT, AMD V, these CPUs control access to privileged instructions. Advantages: Flexibility, run different OSs from multiple vendors. Caveats: We can t emulate other archs. ; Performance. Examples: VirtualBox, Xen + Intel VT.
19 Paravirtualization Hypervisor exports a modified version of the host. Exported VM is of the same architecture as the host. Advantages: Performance (lightweight and fast), scalability and manageability; strong isolation; allow virtualizing without need special CPU. Caveats: For same architecture. Requires porting Guest OS. Example: Xen with standard CPU. 22 Desktop virtualization Decoupling of a users physical machine from the desktop and software he/she uses to work. It emulates the PC hardware environment of the client and run a virtual machine alongside the existing operating system located on the local machine or delivered to a thin client from a data server. Desktops as a service: transforming desktops into a cloud service. Different approaches. Citrix XenDesktop, Sun VDI, VMWare View. 23 Desktop virtualization: Advantages Instant provisioning of new desktops. Desktop computing power on demand. Significant reduction in the cost of new application deployment. Near-zero downtime in the event of hardware failures. Ability to access the users enterprise desktop environment from any location. 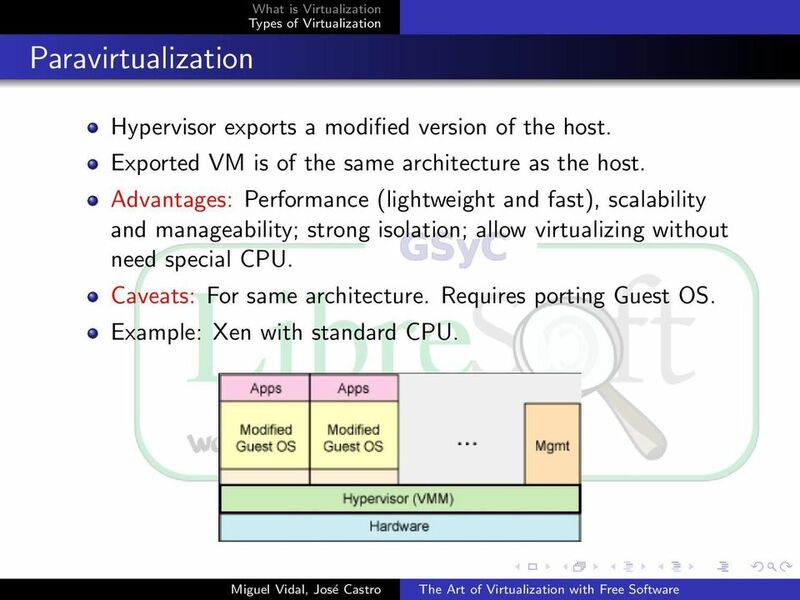 25 Xen: Benefits What is Virtualization Independence between virtualized systems. You can restart, and create independently. Better utilization of hardware of the machine: balancing resources. A virtual machine can get more resources if needed instead the other VM. Easy to backup, only with a copy of the virtual machine, it can be booted on a new server. Also, Xen allows hot migration, providing flexibility and little recovery time before an incident. You can modify parameters such as RAM, number of CPUs, disk space... to solve the needs of the virtual machine. Test and Development Environments: multiple virtual machines on a single physical server for testing and development on a single machine simultaneously. 27 Kernel-based Virtual Machine (KVM) KVM is a Linux kernel virtualization infrastructure. 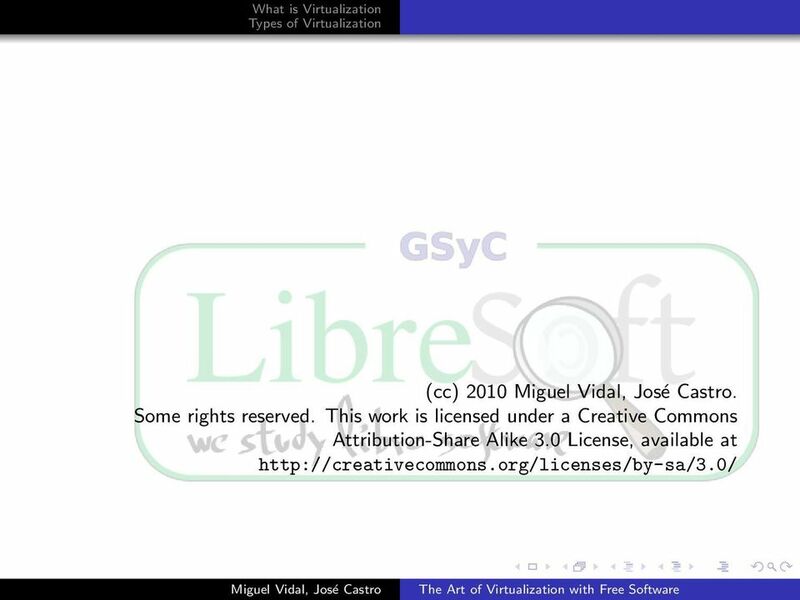 Native virtualization using Intel VT or AMD-V. First version was included in Linux (February 2007). A wide variety of guest operating systems work with KVM: Linux, BSD, Solaris, Windows, Haiku, ReactOS and a patched version of KVM is able to run Mac OS X. It does not perform any emulation: a user-space program (Qemu) uses the /dev/kvm interface to set up the guest VM s address space. 28 OpenSolaris xvm projects VirtualBox: VMs for all. Cross-platform. 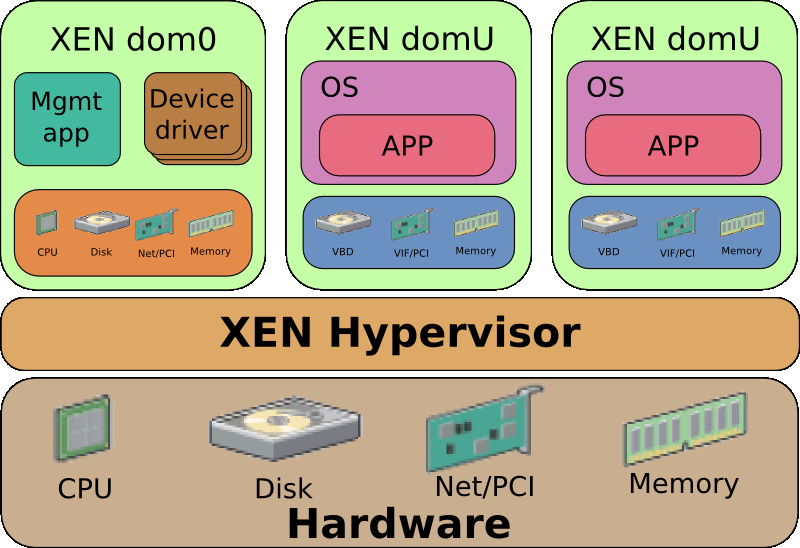 xvm server: Xen on Opensolaris Logical domains (LDOMs): Type 1 hypervisor, full, for Sparc platform. Zones: Lightweight virtualization for OpenSolaris. Other: Sun xvm Ops center, Sun xvm VDI. 29 Containers and zones Virtualization which executes several instances of same operating system (and same kernel). Global Zone vs. local zones: we can t exit to the global filesystem (advanced chroot) Without hypervisor nor virtual hardware. Provisioning and administration very simple. x86: with branding support. From 2005 is part of Solaris 10 (and OpenSolaris). Similar to FreeBSD jails, OpenVZ (Linux containers) or Linux-VServer. 30 LDOMs virtualization Full virtualization, Type 1 hypervisor based. It requires special CPUs (Chip Multithreading = CMT). Each domain is a full virtual machine with a reconfigurable subset of hardware resources. Operating systems running inside Logical Domains can be started, stopped, and rebooted independently. Base OS: Solaris 10 / Opensolaris Virtual machine OS: Solaris 10, Opensolaris , Sparc Linux, and other OS which support this architecture. But for now, only SunOS is supported. 31 Chip Multithreading (CMT) UltraSparc T1 / T2. Multithread. A thread is similar to a CPU. Example: T1 has 8 cores with 4 threads/core. Direct SSL support on hardware (1 MAU/core). LDOMs can assign cores to VMs. Hypervisor runs on server firmware. Free/Open Hardware: Sun Fire T / Enterprise T / Blade T servers. Practical Applications of Virtualization. Mike Phillips <mpp@mit.edu> IAP 2008 SIPB IAP Series http://stuff.mit.edu/iap/ http://stuff.mit.